In today's job market, in which companies might interview dozens or even hundreds of people for one position, first impressions are more important than ever. Interviewees need to pay attention to everything from what they wear and how they are groomed to their body language. One important, and often overlooked, aspect of an interviewee's first impression is color. The color of your clothing sends a subconscious message to the interviewer about your personality. Read below for tips on what colors to wear to an interview to make the best first impression. The right colors can help convey your confidence, professionalism and your ability to fit into an organization's environment. 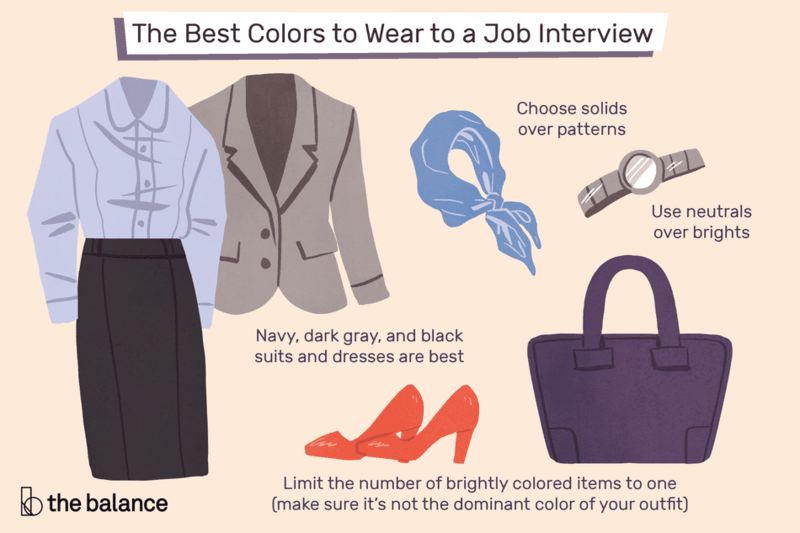 Below are a few tips for choosing the right colors for your interview attire. An important rule of thumb is to try not to be remembered for your attire; you want to wear something that allows the interviewer to focus on your skills and qualifications rather than your wacky style. Wearing solid colors helps ensure that your clothes will not distract. Solid navy, dark gray, and black suits and dresses, in particular, look professional without being distracting. Small patterns, like thin pinstripes, are okay as well. The rule of thumb is to select a pattern that is small enough that it looks like a solid from across a room. Again, you do not want to be remembered for your attire; if you wear a very brightly colored suit or dress, you will almost certainly be remembered for your outfit (rather than your job qualifications). Neutral colors – navy, gray, black, and brown – are the best colors for a job interview. White is also an excellent color for a blouse or button-down shirt. You can certainly add a pop of color to a neutral interview outfit. For example, a pale blue blouse under a woman's dark gray suit can subtly soften a look. A splash of bright, bold color (such as a red scarf or tie) conveys authority and can be great for managerial positions. Limit the number of brightly colored items to one, and make sure it is not the dominant color of your outfit. No bright orange suits! Do a bit of research on the company's work environment before your interview. You want to wear colors that show you will fit in with the company's culture. In an office that tends to dress more conservatively, you should definitely stick to neutral, solid colors. However, in more casual offices, such as some startups and nonprofit organizations, you can feel comfortable wearing a bit more color. Softer colors (such as a pale blue blouse) in particular work well for more casual offices, because they convey a bit of personality without being overwhelming. If you are applying for a job in fashion, or a sales job at a unique clothing store, you might feel free to be a bit more creative in your coloring to show your sense of style. If you are in any doubt about the company's culture, it is best to dress conservatively, with neutral, solid colors. Black is a very popular color for suits and dresses in interviews. However, black is a very commanding color that conveys a lot of power, authority, and even drama. This is a good color for a job in a conservative environment like a law office, or for an interviewee applying for a high-level executive position. However, black can be a bit overwhelming in a more laid-back office environment and can make you appear unapproachable. Using black as an accent color (for example, in a scarf or tie) can give you a sense of authority without being overwhelming. Crisp and clean, white is a great color for shirts and blouses. The color conveys truth and simplicity and adds a bit of brightness without being too overwhelming. Brown is a neutral color that evokes feelings of calm. It is a great solid, neutral color for an interview. Red is a bright, powerful color that conveys energy and passion. A pop of red (for example, in a scarf or tie) can convey just the right amount of passion without making you appear too emotional. Blue, particularly navy, is another great neutral color for interview outfits. Blues convey feelings of calm, trust, and confidence – great qualities for an interviewer to sense in you. Blue is also many people's favorite color, and wearing an interviewer's favorite color will always make a great first impression.